The Launch Code Reader Professional CRP123 Premium (CRP 123P) combines the lines between a code scanner and a skilled mid-line scan tool. With features beyond the usual reading & clearing of fault codes, it takes you to a new level of diagnostics with added capabilities such as enhanced data stream for ABS, SRS, transmission and engine. Read & clear fault codes of engine, ABS, SRS and automatic transmission for more than 30 vehicle brands! The Auto Scanner Tools CRP123 premium from Obd2tool.com is was developed to test four major systems: engine, transmission, airbag (SRS) and anti-lock brake systems (ABS). it now features a new bigger 4.0″ TFT color screen, powerful diagnostic functions, such as reading DTCs, clearing DTCs and reading real-time live data streams. 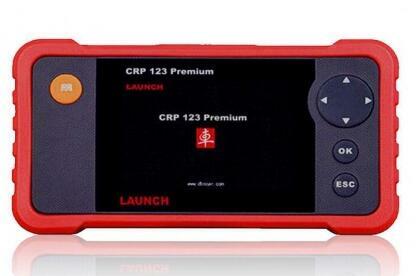 The CRP 123 also features the following, I/M readiness, MIL status, vin info and EVAP system testing. This new automotive diagnostic tool supports All 10 modes of OBD II tests for a complete diagnosis. Upgrades to the latest software are now done through a pc with a USB cable. With the CRP123 from www.cnautotool.com automotive repair professionals can diagnose and repair vehicles more efficiently, accurately and profitably.